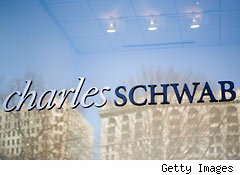 Declining trading volumes at Charles Schwab (NYS: SCHW) weren't enough to stop the discount broker-turned-major banking player from reporting a 16% year-over-year jump in quarterly profits. Let's take a look at how the company managed to pull off increased profits despite lower trading activity and volatile interest rates across the industry. While declining trading volumes and retreating clients resulted in a 12% fall in rival TD AMERITRADE's (NAS: AMTD) quarterly profit, Schwab posted a jump in its net income. Higher asset management fees and almost double the profit on interest revenue helped it offset weaker trading and increase its net income to $238 million, from $205 million in the second quarter of 2010. Schwab's revenue rose 10%, to $1.19 billion. The company reported $502 million in asset fees, a 15% increase from the second quarter of 2010. Net new assets collected were up 10% while total client assets reached $1.66 trillion -- a 22% leap. Trading revenue, which declined by 12% year-over-year, accounts for less than 20% of total revenue. Chuck will surely benefit from the acquisition of optionsXpress (NAS: OXPS) , as the latter has been experiencing improvements in key business metrics such as daily average revenue trades (DARTs), new brokerage accounts, and brokerage assets. Now, to expand its investment business, Schwab has decided to partner with Broadridge Financial (NYS: BR) . Through this deal, it intends to launch multicountry and multicurrency offerings in the first quarter of next year and secure its foothold in the global investment trading market. With yet another impressive quarter and a few more smart deals in the offing, I remain optimistic on Schwab. Please post your comments below. At the time this article was published Fool contributor Zeeshan Siddique does not own any of the stocks mentioned in the article. The Fool owns shares of and has written puts on Broadridge Financial Solutions.Motley Fool newsletter serviceshave recommended buying shares of Charles Schwab and optionsXpress Holdings. Try any of our Foolish newsletter servicesfree for 30 days. We Fools may not all hold the same opinions, but we all believe thatconsidering a diverse range of insightsmakes us better investors. The Motley Fool has adisclosure policy.